It is often said that to manage something, you need to be able to measure it, and understanding soil is the first step into precision farming. Yields can be affected by a number of factors which can impact a soil’s ability to provide crops with the correct growing environment in order to thrive. These can include (but are not limited to) soil type and texture, organic matter (OM), pH, compaction, nutrient availability, moisture, soil biology and land topography. Agrovista’s Plantsystems precision agronomy portfolio includes an advanced soil scanning service, using the Veris U3 scanner, which can measure electro-conductivity (EC), pH, OM and topography in one pass as continual sets of data. Plantsystems precision specialist Steve Butler says: “The Veris U3 machine is becoming popular with many of our customers due to the vast number of maps it can create using the data it captures. “Data collected on its own provides a very good indication of a soil’s characteristics. The Veris scanner performs three functions. A set of discs is introduced into the soil and an electric current is passed between them to measure the resistance exerted by the soildown to 600mm deep, giving an EC measurement used to assess soil variability. To record OM levels, a separate shoe goes into the ground at 25-50mm to give a smearing effect, with infra-red light used to measure light and dark areas of soil which accurately represent the OM present. At the rear of the unit, pH is measured using a pair of probes which are activated when the machine is stopped, recording the sampling location at the same time. Readings are averaged between the two probes before lab analysis gives the pH status of the sampling point. High and low areas for readings are calculated and further soil sampling can be targeted between these areas. Operation ideally takes place on stubble, as the air present in cultivated soils can increase the difficulty of filtering data, and in large fields, the Veris can cover 150-200 hectares/day. Mr Butler then inputs data for analysis in the lab, where a customer report is created. Once data has been collected and calibrated with lab results, zones can be created using multiple data sets from the U3 to study a range of parameters. Zones can then be used to either manage inputs or aid with investigation work into low yielding areas of the field. Mr Butler says: “We can share information with the customer as a PDF via email, and if required, a subsequent meeting is arranged to go through data and discuss further services or actions. The customer’s data is also given to them for future use. “EC is a widely used and common method of gaining information on where soil changes in a field. An electric pulse is sent through the soil, measuring its resistance. This creates an extremely accurate map of how soil varies in a field. OM is becoming a very strong talking point across the country, with the UK average at 3%, Mr Butler says. 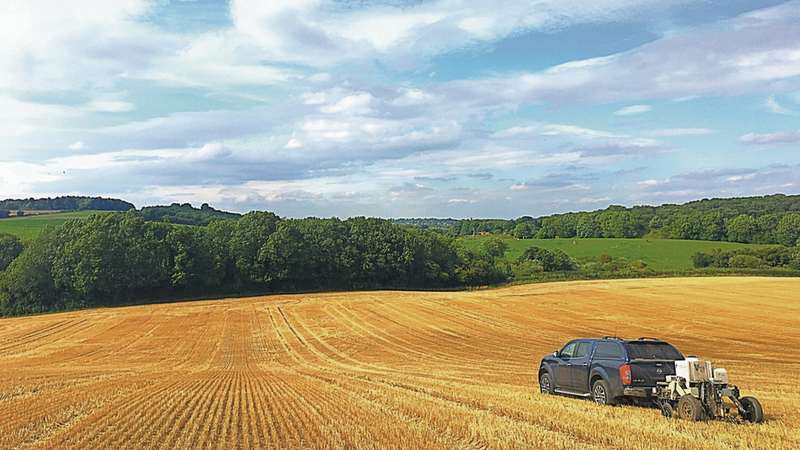 While the Veris is scanning soil, a GPS receiver on the machine is constantly transmitting the machine’s location on the ground, providing highly accurate measurements of topography. Nitrogen leaching risk maps use topography and the EC data gained to assess where nitrogen is most and least likely to leach through soil. Water capacity maps collate the above data to show where water is most likely to collect in the field. Mr Butler says: “This can prove useful for planning irrigation, in particular. Using data from the scanner, maps are created to show where seed rates can be adjusted using variable rate seeding equipment for optimum growth in the field. Mr Butler sees particular demand for the service to get optimum value from variable rate seeding, which he points out is becoming common practice on many farms across the UK. He says while technology is making great strides in improving our ability to assess and get the best from soils, it complements, rather than replaces, farmer experience. Costs depend on the area to be scanned and the level of data to be gathered, but average at about £30/ha.